a brave but reluctant contactee. Collier describes in detail the members of this malevolent ET confederation consisting of reptilian ETs from Alpha Draconis, the Orion Group, and the grey ETs from Zeta Reticuli 2, and it appears that the Alpha Draconan reptilian ETs have been manipulating humanity into a nearly invisble system of servitude for aeons, feeding off of our labor and our bodies through the wars that they instigate and the hostile belief systems which they foster in the form of religious and social instituions. To proceed to subsequent segments, CLICK on the video response by UFO Hypotheses, which is located under the YouTube Flash Player under the heading "Comments & Responses: Video Responses," and then repeat to end. For the transcription of this interview: "UFO Hypotheses featuring Alex Collier, Volume One," visit E.A.R.S. Webpage dedicated to the Alex Collier. In the fifth DVD of the "UFO Hypotheses" series, Collier, a UFO contactee since the age of eight years, speaks openly and candidly to a small crowd of about twenty people on Easter Day, 1995 regarding a great many things about the pyramid structure of regressive ETs that control the highest levels of the shadow government of the United States, and warns of an upcoming abuse of power by the NSA, now evidenced by Patriot Acts 1 and 2, aimed by Congress to upend our Constitution and constitutional government and in the end make Congress themselves irrelevant. Here is the perspective of one group of ETs regarding most of our U.S. leaders, and the very fragile state of our environment, our basic freedoms and our human rights. From a lecture held in Tucson, Arizona in 1995 concerning the collaboration between secret government agencies and leaders who are collaborating with a malevolent ET confederation. In the tenth DVD of the "UFO Hypotheses" series, Alex Collier, after fourteen years, again sits down with Rick Keefe for a discussion including inspired conversation on the current state of affairs in the United States, ET intervention on Earth, future challenges we are beginning to face now, the history of Atlantis, and individual purpose. As many of you are aware, I am being bitterly attacked from the Billy Meier/FIGU camp, especially by their U.S. publicist, Michael Horn. I am being addressed as a liar and a fraud. Apparently, because I changed my name and at most times in my life during on going contacts, I chose to not share this reality with people who were acquaintances. Why would I? You also need to know that I have addressed this issue publicly in earlier lectures years ago. But maybe it’s necessary to deal with it for the last time. In the early 90's when I came forward, the talks were very small. More like living room chats, just a hand full of people. I stopped speaking in 2002. After being addressed in front of my mailbox by three well dressed men that were part of a "Program", I was told to "Shut the f*#@ up". I was then told that friends were going to be hurt if I did not shut up. The names were given to me. They were not kidding and it wasn't a joke. They were going to kill friends and family members. Fast forward the internet. I had no idea that the information would go where it has. In 1990 when Morenay had asked me to speak and share "some of my experiences" I reluctantly said yes. I spoke to my Dad regarding this. My dad had an experience of my contacts when we lived in upper state NY. We spoke of it that morning and as my Dad was a strong catholic, his questions were very direct. I felt that if I was going to speak he needed to know. Dad was afraid of what would not only happen to me but our family. My brothers and sisters, and himself by government and religious harassment, etc.... We spoke about using another name to share the information in some way to protect my family. At times in my life while contacts were on going it has been very difficult and hard to share it. I had a head full of knowledge, and experiences but could not share it. I was told that at those times there was no one I could truly trust. When I did not listen to the “Andromedans”, they would prove to be right. Supposed friends betrayed and stole from me. Enough said about that. I have shared the information that I was asked to. I don't sell anything. I was told by the Andromedans not to make a business of this in any way. And so I haven't. I have tried very hard to keep a low profile and protect my family from hurt and prejudice, by those who don't give a damn about my family. All they want is to keep their name in lights and beat their chest, by declaring they have the secret and they are the only ones with the truth. That Mr. Billy Meier is the only contactee in the entire world. That’s the lie, Ladies and Gentlemen. Billy is not and nor has he ever been the only one. I am very saddened that many researchers and authors who have found their own evidence to collaborate information shared by the Andromedans and other races are now being attacked for it. They are also accused of being involved in and perpetrating a fraud. Dr Salla, Paola Harris, and Col.Wendelle Stevens to just name a few. They have tirelessly dedicated themselves to helping humanity. Mr. Horn’s accusations are despicable. Paola Harris is one of the most honest and sincere persons on earth, whose integrity is beyond reproach. It’s disgusting that she should continue to be abused and harassed by this man only because she interviewed me. She was simply doing her job in the most objective way. Dr. Salla's efforts to help bring humanity together and see the bigger picture will have a profound effect on humanity in a positive way for decades. And I also feel that Dr Salla's honesty is beyond reproach. Col. Stevens, whom I met for the first time in Japan, is a real gentleman. He has tirelessly researched contactees for 50 years. His should be the only voice any of us listen to regarding who is a real contactee or not. And his work is probably the largest single contribution to humanity regarding Exopolitics. Point of fact. Ladies and Gentlemen, I frankly at this point don't care if any of you believe or not. All the research, all of the sacrifices everyone in this field has made and will make is due to endless hours of lost family time, as well as the loss of family and peace of mind. And of course the ridicule from others, who have no clue how huge and important this subject really is. This has been and was done for humanity. This is for us as a race to have a new perspective, a new place to start when the lies of our false history collapse under the weight of truth, that we are not alone and have never been; a revelation that we are so much more than we have been told. The “lie” is that Billy Meier is the only contactee. And if the "Pleiadians" (excuse me) "The Plejarians" (they changed their name, too), told Billy he was the only one, then they have lied. You must keep this in prospective also as well. There are in fact many contactees in the world. I have been told that there are at least 1,407 at this present moment. You may be one of them yourself. I think we should continue to move forward and help humanity achieve its potential. Ladies and Gentlemen, in closing I have given what I can. It’s out there and that's what I agreed to do. You can choose to read it, listen to it, and research it or not. The information is the Andromedans' prospective. That's it. I would of course always encourage you to research the field. There is a wealth of information out there by many great dedicated researchers and speakers. NO ONE HAS THE WHOLE STORY. But it’s for you to discover who you are and your place in this drama of conscious and spiritual evolution. Be your own savior. Take the pressure off of GOD and help yourself. The worst case is you will be an inspiration and leader to others, to invest in themselves and see themselves as they truly are: genetic royalty and incredible beings. I feel it’s necessary to add this last clarification for you. I have no vested interest in this information. And as such I really could care less what anyone thinks. My intention was to share the information and give a different prospective. I have had a lot of growth to go through and am now the father of five. I must put the welfare of my family first and move beyond this sideshow with FIGU/Michael Horn. To all, below is a statement by Alex Collier concerning recent criticisms against him by Michael Horn. Horn's main criticisms are that Alex did not confide his childhood contact experience to Horn and others in the mid-to-late 1980s; changed his name prior to going public with his claims in the early 1990s; and has not provided hard evidence to support his claims. Alex satisfactorily responds to the first two criticisms and explains why he went silent in 2002 due to threats against family and friends. Such threats pertain to the release of hard evidence in favor of his claims. As a former human rights investigator and researcher, professional standards and ethics always need to be applied to witnesses of events whose retelling involves significant personal risk. Since Alex was then and still is a father with young children, I immediately accepted and respected his concerns. In my five year investigation of Alex's claims, I have found no evidence of fraud, and been privy to additional evidence in support of his claims that has not been made public. I find it ironic that Alex who has not sought to profit from his contact experiences, permits the free distribution of his information and has not encouraged a cult around himself, is attacked by someone who profits from the Meier material, bullies others into surrendering copyright ownership of Meier's photos, and actively promotes a cult movement around Meier as a modern profit; sorry, reincarnated prophet, Enoch/Henoch, Isaiah, Jesus/Jmannuel, Muhammed, etc. I find Horn's internet antics and unscrupulous attacks against Alex Collier and others as transparently directed towards promoting the Meier case. He is after all Meier's U.S. publicist. It is important that people like Alex are protected so they can safely share their material, rather than be hounded for not releasing information to the public that they sincerely believe would endanger family and friends. I stand by my earlier statements that Alex Collier is very credible and a man of great integrity whose friendship I value. For those interested in learning more about Alex Collier's experiences concerning a race of human looking extraterrestrials from the Andromeda constellation, I have created a page here with links, witness statements, video testimonies, and the results so far of my own ongoing investigation into Alex's remarkable claims. has already been viewed by over 10,000 in just three days, and YouTube awarded the site the 64th to the 82nd most watched director on YouTube for two consecutive days to YouTube/UFOHypotheses this week. If you haven't seen it yet, enjoy this rare interview opportunity, the first new interview of Alex Collier by Rick Keefe in fourteen years! stall the moderate and liberal wings of UFO research. God forbid that you listen to Collier with an open mind and make a decision for yourself about the Andromedan information. That's just not something that the the corporate fascists who reside in all areas of the U.S. could stand for long. It appears three days was their limit this time, naturally due to the release of the sensitive information of Alex Collier Volume Three . Who are those men off-stage or behind the curtain who order people tortured and who are those men who have their pockets stuffed with gold, oil and sacrifice the lives of our armed service men and women to further their greedy ambitions? And all it takes is a little of their gold to find its way into the outstretched hand of a lapdog, another desperate puppet in charge of a smear campaign for profit and control of public opinion... giant egos, and hollow hearts. productions with Rick Keefe. [Sharing the material is an honor itself, and reward enough.] Always remember to use your mind and intuition together. Alex Collier has set aside many of his important film and writing projects, and is devoting most of his attention to his wife and children, and his employment in optic technologies. After Alex Collier gave his blessing last month, UFOHypotheses on YouTube now has a fully uploaded 24-segment version of Alex Collier Volume Two DVD, which many of you had been waiting over a year and one half to see since Volume One was uploaded in April of 2007. Thank you for your patience, and thank you for passing out the free Alex Collier Volume Two DVD person to person in the meantime. I believe you will find Alex Collier Volume Two extremely relevant today, some thirteen years after the original lecture took place in Tucson, Arizona on Easter Day, 1995. Alex Collier has endorsed the upload to the UFOHypotheses YouTube site of this special, intimate lecture given in Tucson back in 1995. We will post a link here once the uploading work has been finished. "Albert Einstein and Parallel Earths"
Another in-depth article on Collier, featuring the Andromedan information, is the subject of an excellent journalistic effort by Paul Chen, from "The Canadian" and is called "Albert Einstein and Parallel Earths: Celebrity contactee links New World Order to Manipulative Extra-Terrestrials." The focused piece of writing includes numerous explanations about concepts ranging from parallel time-space continuums, Einstein's theories, and regressive ETs, including current scientific support, and these subjects' relationships to the contactee information offered by Alex Collier from the Andromedans. "Celebrity Contactee Alleges Manipulative ETs"
excellent journalistic effort by Rejean Pelletier, called "Celebrity Contactee Alleges Manipulative ETs," and includes numerous facts on the NASA missions, current scientific support, and historical background regarding the Moon. I have good news in that last night Alex gave me his personal endorsement to distribute TO INDIVIDUALS copies of the DVD Alex Collier Volume Two, which is a lecture that I organized and filmed in 1995 here in Tucson, Arizona. And while I do not need permission to distribute it or put it on YouTube, because of my personal friendship with Alex, I am respecting his wishes as to the dissemination of the DVD because it places Alex into the public spotlight at a time when he is already facing several personal challenges. Specifically, Alex told me last night that he sees no problem at this time with distributing copies of the DVD among individuals, but during his current personal challenges, he requested that I do not upload the DVD Alex Collier Volume Two to YouTube. Alex continues to want the information to be shared, but he does not want the additional publicity. In a nutshell, he wants people to focus on the message, and not the messenger. Under-Appreciated Science Productions is encouraging free distribution of this DVD, except that no copies are to be uploaded to YouTube, Google video, or any such video-sharing site at this time, as per Alex's wishes. Keep in mind that once you have a copy, you may duplicate it as much as you'd like and give it out to friends, but without any money exchanging hands, and with the provision that they not upload it to any video-sharing sites. Give them away to all your friends! UFO Hypotheses hopes to upload Alex Collier Volume Two in the near future to YouTube. In the meantime, please consider the sharing of Alex Collier Volume Two as an exercise in sharing information with each other hand-to-hand, person-to-person, something that we may need to re-consider doing more often. Carrying on meaningful sociological discussions with another individual in this day and age of constant self-gratification and mindless materialism could even be considered a revolutionary act. James Andrew of EARS reports "a very good reaction" to the world premiere of Alex Collier Volume Two at UFODaze last night, and that "people were finding it so interesting," and that "a lot of people are looking forward to seeing it again." It is hoped that Alex Collier Volume Two will be available for free viewing on YouTube within the next couple of weeks. Dr. Michael Salla of Exopolitics.Org on Alex Collier. Also, see this excellent essay: "Typology of ExtraTerrestrial Races," by Dr. Salla, where Salla summarizes key information from Alex Collier's Andromedan information. 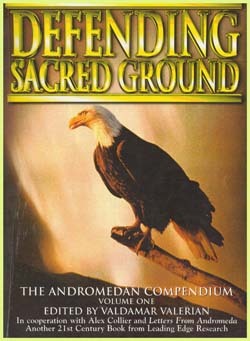 Alex Collier's book "Defending Sacred Ground"
Alex Collier on fatherhood from "The Other Side of the Glass"
This page is highly speculative, since we the public are not priveleged except in rare, contactee cases to see and examine extra-terrestrials, let alone their aircraft and artifacts. However, based on the best evidence available to the public since all the very best evidence is confiscated by the globalist military powers, we can begin to formulate working hypotheses about which alien groups may be benevolent, neutral, or malevolent in regard to their views and actions towards the great population of humanity. (7) various other direct facts and circumstantial facts. The purpose in having gathered decades of this type of research since the 1940s (at least) has been for the public to be able to inform itself, despite the hampering of scientific exploration and cover-up of facts by our own governments. Since most people avoid spending time studying their own history, it would be surprising if those same people would take the time to study the histories offered in regard to our planet Earth and our collective human population by contactees. However, this website is not interested in ignoring these contactee cases, but instead interested in exploring them to see what evidence they may yield in formulating a more broad, accurate vision of humanity's place in a universe populated by a multitude of space-travelling races than is allowed for by currently "approved" scientific analysis. This page designed by Rick Keefe (c)2006-2008 Rick Keefe. All rights reserved.